In Hol Municipality, you and your family will have the opportunity to experience and challenge the skiing skills. There are several resorts to choose from with varying opportunities. If you prefer well-prepared trails, off-piste or terrain parks, if they are not available in Geilo, so the opportunity is not too far away. You will find these ski resorts in Hol Municipality: SkiGeilo, Hallingskarvet Ski Center, Dagali Mountain Park and Lia Ski Center. 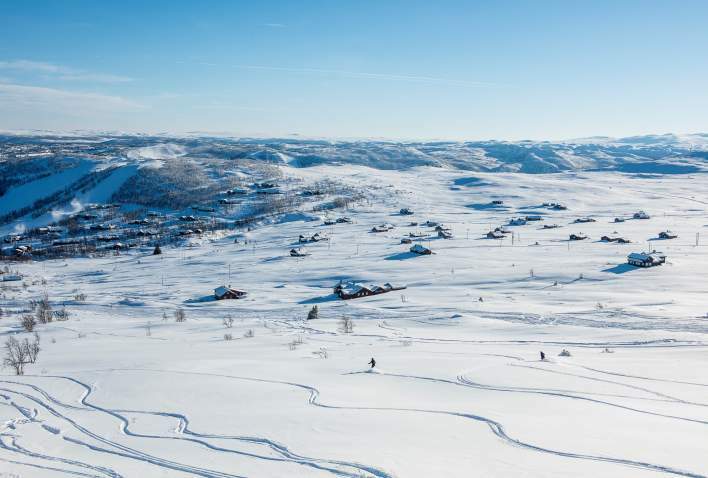 Winter is magical in Geilo, with a spectacular scenery and wonderful winter atmosphere. 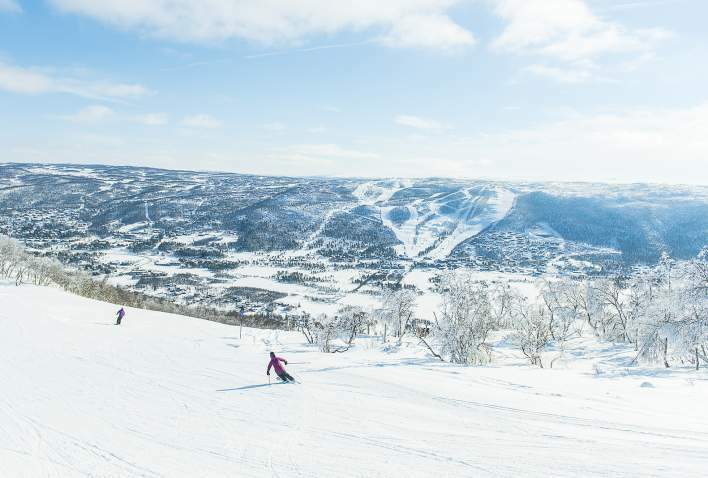 Geilo is a classic ski destination with proud ski traditions. There is no doubt that Geilo is one of Norway’s best ski resorts, with a unique skiing offer for both young and old. You can ski on both sides of the town centre and there are three flexible SkiGeilo buses that allow you to move around easy throughout your stay. With a total of 38 slopes and 23 lifts Geilo is known as a family-friendly destination with a large variation of skiing for all levels. Geilo is a small and charming town, located between two National parks, one of them is Hallingskarvet. Slaatta is located close to town and is one of the best places for children, both beginners and more experienced. There is a children’s area with magic ski carpet and button lifts and lots of fun elements. The Slaattapark contains a good range of jumps and rails with varied degrees of difficulty, but mainly easier elements. For the more experienced, there is a longer button lift that brings you up to the top of the “Slaattajordet”. From the top you can ski back down on green trails or continue with the next lift, the “Korken lift”. From the top the slope opportunities are many, blue, red and black slopes. You can also ski down to Geiloheisen, Havsdalen and Halstensgård. Book ski pass, ski school and ski school online! At Slaatta you will also find the cozy Slaatta Stugu Cafe where the key word is “homemade”. Havsdalen has a children’s area with a children’s lift, and two longer lifts that take you up at Geilohovda. From the top there are several choices between blue and red slopes or Geilo snowpark-Havsdalen. Here you can also connect with Slaatta, Geiloheisen and Halstensgård. A T-bar lift takes you up to Havsdalshovda, where you get one of the best views towards Hallingskarvet. From here you can also try out one of Norways longest toboggan tracks. At the bottom of the hill you will find Havsdalskroa with good food. Havsdalskroa has become famous for its after ski with live music and dancing on the table. Geiloheisen is close to the town center and is a chairlift that brings you up to Geilohovda. Geiloheisen is a good starting point for getting around on the “Geilo center side”. Down to Geiloheisen you can ski blue, red and black slopes. At the bottom of Geiloheisen you will find Taubanekroa cafe, also with after ski. Halstensgård and Fugleleiken is the perfect place for those who like more challenges and speed. Halstensgård has a T-bar lift that takes you up to Gullsteinhovda and leads to both blue, red and black slopes. You can connect with the other areas on the “Geilo center side”. Vestlia has a large parking lot and slopes perfect for families. This has made Vestlia a family favourite. The Troll Club area is adapted for the smallest in the family. Here is a magic ski carpet and a button lift that makes it easy for children to get up the slopes. There are also small challenges like slalom course and small jumps. In this area you will also find the Trollklubben child care, where children from 0-8 years old are welcome. At the bottom of Vestlia you will find a 4-seat chairlift, a T-bar lift, and a button lift. From the top of the chair lift there are a large variation of slopes. From here it is also possible to ski over to the Kikut area. Kikut is a beautiful area with a magic ski carpet, button lift and 2 chair lifts. The chair lifts takes you up to the Kikuttoppen and gives you access to blue trails and two snowparks. Here you can play around and enjoy the view of Hallingskarvet National Park. Kikut also has a six-seat windscreen up to the Kikuttoppen. At Kikut you will also find Kikutkroa cafe with a great variation of good food and drinks. Hallingskarvet Ski Center is the perfect place for free riders. With long, wide hills and big off-piste opportunities, Hallingskarvet Ski Center makes it easy to enjoy. The ski center is located along FV50 in Sudndalen which is on the other side of Hallingskarvet seen from Geilo. Highest altitude difference is 510 meters and runs up to 3 km. The park was developed in cooperation with X-Games, winning Andreas Håtveit.